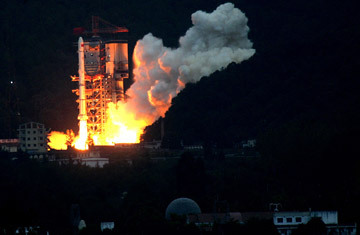 The Long March 3A rocket carrying China's Chang'e I lunar probe blasts off from its launch pad at the Xichang Satellite Launch Center in Sichuan province, October 24, 2007. Both the U.S. and China have announced intentions of returning humans to the moon by 2020 at the earliest. And the two countries are already in the early stages of a new space race that appears to have some of the heat and skullduggery of the one between Washington and Moscow during the Cold War, when space was a proxy battleground for geopolitical dominance. On Monday, the U.S. Department of Justice announced the indictment of a former Boeing engineer for passing sensitive information about the U.S. space program to the Chinese government. According to the indictment, Dongfan Chung, a 72-year-old California man who worked for Boeing until September 2006, gave China documents relating to military aircraft and rocket technology, as well as technical information about the U.S. Space Shuttle. U.S. officials say the Chung case is part of a pattern of escalating espionage by China. "We're seeing this on all fronts," says Dean Boyd, a spokesman for the Justice Department's National Security Division. Since October 2006, the Justice Department has prosecuted more than a dozen high-profile cases involving China, including industrial espionage and the illegal export of military technology. In an unrelated case also announced Monday, a Defense Department employee was arrested in Virginia for passing classified information about the sale of U.S. military technology to Taiwan to alleged Chinese agents. The scale of Chung's alleged espionage is startling. According to the Justice Department, Chung may have been providing trade secrets to Chinese aerospace companies and government agents since 1979, when he was an engineer at Rockwell International, a company acquired by Boeing in 1996. He worked for Boeing until his retirement in March 2003, and continued to work as a contractor for the company until September 2006. The indictment alleges that Chung gave China documents relating to the B-1 bomber and the Delta IV rocket, which is used to lift heavy payloads into space, as well as information on an advanced antenna array intended for the Space Shuttle. According to the indictment, Chinese officials gave Chung a shopping list of information to acquire for them. In one instance, Chung said that he would send documents through an official in China's San Francisco consulate. In another, a Chinese contact suggested he route information through a man named Chi Mak, a naturalized U.S. citizen who also worked as an engineer in California and who was convicted last year of attempting to provide China with information on an advanced naval propulsion system. China's manned space program, codenamed Project 921, is indeed a matter of considerable national pride for a country that sees space exploration as confirmation of superpower status. China is pouring substantial resources into space research, according to Dean Cheng, an Asian affairs specialist at the U.S.-based Center for Naval Analysis. With a budget estimated at up to $2 billion a year, China's space program is roughly comparable to Japan's. Later this year, China plans to launch its third manned space mission  a prelude to a possible lunar foray by 2024. With President George W. Bush vowing to return American astronauts to the moon by 2020, some competition is perhaps inevitable. China's space program lags far behind that of the U.S., of course. "They're basically recreating the Apollo missions 50 years on," says Joan Johnson-Freese, chair of the National Security Studies Department at the U.S. Naval War College and an expert on China's space development. "It's a tortoise-and-hare race. They're happy plodding along slowly and creating this perception of a space race." But there may be more at stake than national honor. Some analysts say that China's attempts to access American space technology are less about boosting its space program than upgrading its military. China is already focusing on space as a potential battlefield. A recent Pentagon estimate of China's military capabilities said that China is investing heavily in anti-satellite weaponry. In January 2007, China demonstrated that it was able to destroy orbiting satellites when it brought down one of its own weather satellites with a missile. China clearly recognizes the significance of this capability. In 2005, a Chinese military officer wrote in the book Joint Space War Campaigns, put out by the National Defense University, that a "shock and awe strike" on satellites "will shake the structure of the opponent's operations system of organization and will create huge psychological impact on the opponent's policymakers." Such a strike could hypothetically allow China to counterbalance technologically superior U.S. forces, which rely heavily on satellites for battlefield data. China is still decades away from challenging the U.S. in space. But U.S. officials worry espionage may be bringing China a little closer to doing so here on Earth.